For the title for the divider of Vedas, see Vyasa (title). For the crater on Mercury, see Vyasa (crater). For the Brahmin community often pronounced as Vyas, see Bias Brahmin. For other uses, see Vyasa (disambiguation). Vyasa (/ˈvjɑːsə/; Sanskrit: व्यास, literally "Compiler") is a central and revered figure in most Sanatana Dharmic traditions. He is also sometimes called Veda Vyās (वेदव्यास, veda-vyās, "the one who classified the Vedas") or Krishna Dvaipāyana (referring to his dark complexion and birthplace). He is generally considered the author of the Mahabharata, as well as a character in it and the scribe of both the Vedas and Puranas, also known as Puranik. Vyasa is also considered to be one of the seven Chiranjivins (long-lived, or immortals), who are still in existence according to Hindu tradition. Vyasa appears for the first time as the compiler of, and an important character in the Mahabharata. It is said that he was the expansion of the god Vishnu who came in Dwaparayuga to make all the Vedic knowledge available in written form which was available in spoken form at that time. He was the son of Satyavatithe, adopted daughter of the fisherman Dusharaj and the wandering sage Parashara (who is credited with being the author of the first Purana, Vishnu Purana). There are two different views regarding his birthplace. One of the views suggests that he was born in the Tanahun district in western Nepal, in Vyas municipality of Gandaki zone of Tanahun district and his name, Ved Vyas, names his birthplace. Another view suggests that he was born on an island in the Yamuna River near Kalpi, Uttar Pradesh, India. Vyasa was dark-complexioned and hence may be called by the name Krishna, and also the name Dwaipayana, meaning 'island-born'. Dhritarashtra, born of Ambika, and Pandu, born of Ambalika and Vidura born to a maid, were born from Vyasa's powers (Siddhis). 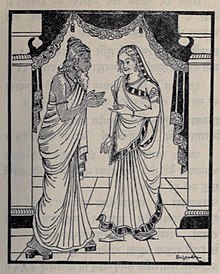 Parashara begot Vyasa with Satyavati. She conceived and immediately gave birth to Vyasa. Vyasa turned into an adult and left, promising his mother that he would come to her when needed. Hindus traditionally hold that Vyasa categorised the primordial single Veda into three canonical collections and that the fourth one, known as Atharvaveda, was recognized as Veda only very much later. Hence he was called Veda Vyasa, or "Splitter of the Vedas," the splitting being a feat that allowed people to understand the divine knowledge of the Veda. The word vyasa means split, differentiate or describe. In every third world age (Dvapara), Vishnu, in the person of Vyasa, in order to promote the good of mankind, divides the Veda, which is properly but one, into many portions. Observing the limited perseverance, energy and application of mortals, he makes the Veda fourfold, to adapt it to their capacities; and the bodily form which he assumes, in order to effect that classification, is known by the name of Veda-vyasa. Of the different Vyasas in the present Manvantara and the branches which they have taught, you shall have an account. Twenty-eight times have the Vedas been arranged by the great Rishis in the Vaivasvata Manvantara... and consequently eight and twenty Vyasas have passed away; by whom, in the respective periods, the Veda has been divided into four. The first... distribution was made by Svayambhu (Brahma) himself; in the second, the arranger of the Veda (Vyasa) was Prajapati... (and so on up to twenty-eight). Vyasa is traditionally known as the chronicler of this epic and also features as an important character in it. According to the legend, the sage Vyasa was the son of Satyavati and Parashara. During her youth, Satyavati was a fisherwoman who used to drive a boat. One day, sage Parashara was in a hurry to attend a Yajna. Satyavati helped him cross the river borders. On this account, the sage offered her a mantra which would result in begetting a son who would be a sage with wisdom and all good qualities. Satyavati immediately recited the mantra and thus Vyasa was born. She kept this incident a secret, not telling even King Shantanu. After many years, Shantanu and Satyavati had two sons, named Chitrangada and Vichitravirya. Chitrangada was killed by Gandharvas in a battle, while Vichitravirya was weak and ill all the time. Satyavati then asked Bhisma to fetch queens for Vichitravirya. Bhishma attended the swayamvara conducted by the king of Kashi (present-day Varanasi), and defeated all the kings. He abducted three princesses Amba, Ambika and Ambalika. Amba, later was a source of trouble to Bhishma. Amba was in love with the prince of Shalva and when Bhishma learnt about this, he allowed her to go to Shalva, who rejected her. She came back to Bhishma and asked him to marry her, which he could not due to his vow. She shuttled between Bhishma and Shalva with no success. Due to this she vowed to kill Bhishma. During the wedding ceremony, Vichitravirya collapsed and died. Satyavati was clueless on know how to save the clan from perishing. She asked Bhishma to marry both the queens, who refused, as he had taken a vow and had promised her and her father never to marry. He, therefore could not father an heir to the kingdom. Later, Satyavati revealed to Bhishma, secrets from her past life and requested him to bring Vyasa to Hastinapur. Sage Vyasa had a fierce personality and a bright , glowing spiritual aura around him. Hence upon seeing him, Ambika who was rather scared shut her eyes, resulting in their offspring being born blind. The child was Dhritarashtra. The other queen, Ambalika, upon meeting sage Vyasa turned pale, which resulted in their child being born pale. He was Pandu. Alarmed, Satyavati requested Vyasa meet Ambika again and grant her another son. Ambika, instead sent her maid to meet Vyasa. The duty bound maid was calm and composed; she had a healthy child later, named Vidura. While these are Vyasa's sons, another son Shuka, born of his wife Pinjalā (Vatikā), daughter of the sage Jābāli was his true spiritual heir. Shuka appears occasionally in the story as a spiritual guide to the young Kuru princes. 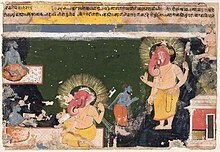 In the first book of the Mahābhārata, Vyasa asks Ganesha to assist him in writing the text. Ganesha imposes a precondition that he would do so only if Vyasa would narrate the story without a pause. Vyasa set a counter-condition that Ganesha understand the verses first before transcribing them. Thus Vyasa narrated the entire Mahābhārata and all the Upanishads and the 18 Puranas, while Lord Ganesha wrote. Vyasa's Jaya (literally, "victory"), the core of the Mahabharata, is a dialogue between Dhritarashtra (the Kuru king and the father of the Kauravas, who opposed the Pāndavas in the Kurukshetra War) and Sanjaya, his adviser and charioteer. Sanjaya narrates the particulars of the Kurukshetra War, fought in eighteen days, chronologically. Dhritarashtra at times asks questions and expresses doubts, sometimes lamenting, fearing the destruction the war would bring on his family, friends and kin. Sanjaya, in the beginning, gives a description of the various continents of the Earth and numerous planets and focuses on the kingdom of Bhārata lineage that comprises India, Nepal, Tibet, Pakistan, Afghanistan, Sri Lanka, Iran, Cambodia and several other countries in south-Asian subcontinent. Large and elaborate lists are given, describing hundreds of kingdoms, tribes, provinces, cities, towns, villages, rivers, mountains, forests, etc. of the ancient region of Bhārata Varsha. Additionally, he gives descriptions of the military formations adopted by each side on each day, the death of individual heroes and the details of the battles. Eighteen chapters of Vyasa's Jaya constitute the Bhagavad Gita, a sacred text in Hinduism. Jaya deals with diverse subjects, such as geography, history, warfare, spirituality and morality. 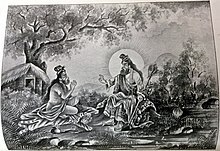 The final version of Vyasa's work is the Mahābhārata. It is structured as a narration by Ugrasrava Sauti, a professional storyteller, to an assembly of rishis who, in the forest of Naimisha, had just attended the 12 year sacrifice known as Saunaka, also known as Kulapati. There may have been more than one Vyasa, or the name Vyasa may have been used at times to give credibility to a number of ancient texts. Much ancient Indian literature was a result of long oral tradition with wide cultural significance rather than the result of a single author. However, Vyasa is credited with documenting, compiling, categorizing and writing commentaries on much of this literature. ^ Strauss, Sarah (2002). "The Master's Narrative: Swami Sivananda and the Transnational Production of Yoga". Journal of Folklore Research. Indiana University Press. 23: 221. JSTOR 3814692. 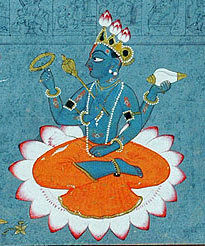 ^ "Vishnu Purana". Retrieved 15 March 2014. ^ F. Raymond Allchin, George Erdosy (1995). The Archaeology of Early Historic South Asia: Emergence of Cities and States. Cambridge University Press. ISBN 0-521-37695-5.